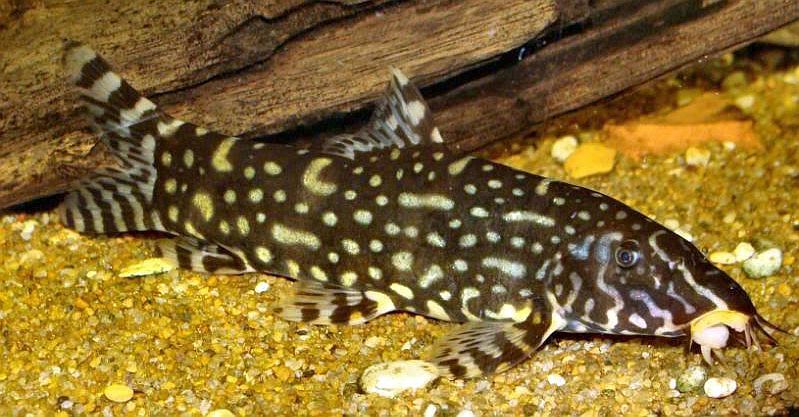 The Angelicus Botia Loach (Botia angelicus) has recently been reclassified as Botia kubotai, and is known as the Angelicus Loach, the Polka Dot Loach and the Burmese Border Loach. The Angelicus Botia Loach was discovered by collectors in western Thailand along the Myanmar (Burma) boarder in the Ataran River (Kasat River) in the Salween River system. They are found in fast moving water with parameters at temperatures of 77 – 86 °F, pH 6.5 to 6.9, and dGH 0 to 8.0.
brown. The entire body and fins of this Loach is barred and spotted with tan markings that give the fish it’s unique look. Like other Botia loaches, the fish can be identified by the four pairs of barbels protruding from the mouth area. Like other loaches, the Angelicus Botia is a peaceful, schooling, bottom feeder that does best in an aquarium setting when kept in groups of five or more individuals. They enjoy the company of others of their own species, but will school with other peaceful bottom dwelling fish of the same size. Like the Clown Loach, they benefit from being in a planted tank with caves, holes, driftwood , or other places to hide when sleeping. Because it’s natural habitat is the warm water streams of Myarmar, they need water movement in the aquarium. A powerhead or two will keep them healthy and happy in a large aquarium setting. The breeding habits of this species are not known and no successful captive breedings have yet been recorded by tropical fish keeping enthusiasts. Its a good idea to treat Angelicus Botia Loaches for internal parasites before introducing them into your aquarium. This a common problem with all wild-caught bottom feeder fish. The Angelicus Botia Loach is an omnivorous species and will eat a variety of foods in small amounts, several times a day. They will eat most prepared food flakes made with vegetable matter and most foods normally offered to freshwater fish. They will also benefit from regular feedings of small shrimp, bloodworms , black worms, brine shrimp and sinking pellets. They will eagerly rid your tank of any snails.